While syrah is gutsy and intense, blends of syrah, mourvedre and grenache are lighter on their feet, and have a drink-ability that can’t be…beat. Our 2002 offering is the first one we have made that features a majority of mourvedre, so it shows off the racy qualities of that varietal. We go through a huge amount of effort to get top quality mourvedre. In this case we are using a superior French clone that was brought into the state relatively recently, and work to control the crop quantity by trimming each cluster seven times. The resulting wine was totally captivating and required only a little syrah and grenache to give it balance and completeness. 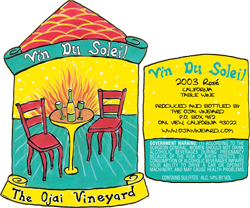 The Vin du Soleil is exciting to drink now, yet it will continue to develop for 5 to 8 years.